DAYTONA BEACH, Fla. — Tyler Reddick had to wait more than three hours for the finish of Saturday’s PowerShares QQQ 300 at Daytona Int’l Speedway, but for the 22-year-old California native, the end result was certainly worth the wait. In his debut with JR Motorsports, Reddick never led a lap in regulation, but found his way to the front during the second attempt of a five-overtime thriller and held off a snarling pack of cars on three subsequent restarts to capture his second-career NASCAR XFINITY Series win and first at the ‘World Center of Racing’. Reddick actually lost the top spot coming off turn four on the final lap, as his teammate Elliott Sadler edged ahead on the inside, but used the side-draft to pull Sadler back coming to the line and got to the checkered flag first by an inch or two, at most. The photo finish was so close that NASCAR timing and scoring listed the official margin of victory as .000 of a second and a video review was necessary to determine the victor, making it not only the closest finish in Daytona Int’l Speedway’s history, but also the closest in NASCAR national series history as well. The previous record-holder in that category was a NASCAR Camping World Truck Series race at Colorado National Speedway on July 15, 1995, when Butch Miller defeated Mike Skinner by .001 of a second. For Reddick, his quest for an XFINITY Series title kicked off in style, as he looks to deliver crew chief Dave Elenz and the No. 9 Chevrolet Camaro team a second-straight championship after William Byron’s incredible rookie run last year. Although the early laps of Saturday’s race went mostly clean and green, the race ended a combined 23 laps past the advertised endpoint, taking more than three hours to complete and spanning a total of 357.5 miles. 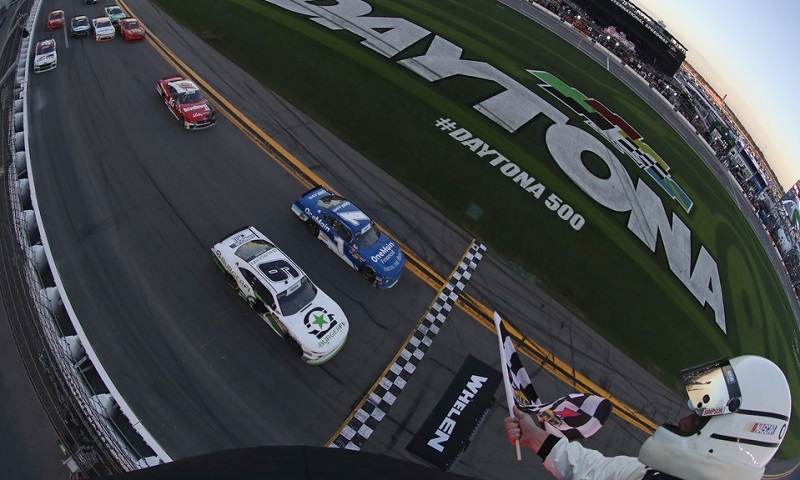 The five overtime periods set a series record, while the 12 caution periods within the race marked a new high for an XFINITY Series race at the ‘World Center of Racing’.